The International Day of Nonviolence is marked on 2 October, the birthday of Mahatma Gandhi, leader of the Indian independence movement and pioneer of the philosophy and strategy of non-violence. The author of these lines, Dr. Surya Nath Prasad wrote his Focus article on the theme: Peace and Nonviolence on the request of Editor-in-Chief Kwang Hyun Kim for Sang Saeng (Living Together Helping Each Other) – a UNESCO-APCEIU Magazine for its Special issue published in No.27, spring, 2010 at the close of UN International Decade for Peace and Nonviolence. UNESCO’s Asia-Pacific Centre of Education for International Understanding (APCEIU) Director Lee Seunghwan remarked in his Message on the article of Dr. Prasad: “This issue of SangSaeng focuses on peace and nonviolence, Scholar Surya Nath Prasad defines peace education as education of the self or developing man’s five elements.” In fact, good governance is the necessity for nonviolence which urgently requires knowledge and practice of peace education by all. The author of these lines Dr. Prasad would like advise the readers to refer to his popular article: Peace Education for Genuine Democracy, Good Governance and Nonviolence published in Transcend Media Service on 21 April, 2014, and his speech on the theme: Global Governance for Security and Peace: The Role of Peace Education published in Global Governance in 21st Century in 2000 by Kyung Hee University, Seoul, Republic of Korea to be enlightened in the field of good governance for nonviolence. Indian Prime MinisterNarendra Modi’s call for good and intelligent people to join politics for good governance is after a long gap of advices about good governance in politics given by Plato who warned us, “The penalty the good men pay for refusing to take part in government is to live under the government of bad men”, Dr. Lala Hardayal who said, “Ministers of the world state will be sages and saints; its civil servants will be scholars and scientists”, Pitrim. A. Sorokin who hoped and believed saying, “Ascending governments of scientists of all nations, the United Nations and the future world government can be enormously improved in their moral strength and wisdom by including in all governments these sages and experts. Their presence can prevent the governments from committing moral blunders, can increase their wisdom and morality and reinforce the total moral and spiritual order in the human universe”, in 1992, UNESCO’s Council of Sages of 21 World’s most eminent intellectuals reflected on the vital issues of time which might affect the lives of all the planet’s inhabitants such as the “eruption of political, religious and ethnic intolerance”, which Algeria’s Mohammed Bedjaoui, jurist and member of International Court of Justice in Hague considered to be one of the most alarming situations facing the world today, and Writer and former President of Czechoslovakia, Vaclav Havel tells, “in a way the forum (the Council of Sages) is an experiment, and we cannot foresee exactly how it will develop, however it might grow into one of those institutions that will help enrich the realm of politics, international relations and international co-operation, with certain broader cultural and spiritual dimension which in my view is much needed in today’s politics…”. It is good sign that the Government of India has set up the National Centre for Good Governance (NCGG) to provide institutional framework to improve governance and ensure that fruits of development reach the poorest of the poor., and also to improve Good Governance reforms through research, policy analysis, advocacy and capacity building in order to strengthen institutions that deliver good governance and foster democracy. The National Centre for Good Governance organized One-Day National Stakeholders’ Consultation on December 20, 2014 at 9.30 a.m. at Vigyan Bhvan Annexe, New Delhi to finalize the Centre’s vision and mission. The Author of these lines, Dr. Surya Nath Prasad was also invited as one of the participants for that Consultation meeting. But he could not attend that very important meeting on good governance due to urgent personal prior engagement on that day, hence he was not in a position to take part in the deliberation, and extends his suggestions for execution for better governance (services) to the people by the members of legislative, executive, judiciary and bureaucrats and all persons who have concern with the people for genuine and prompt delivery of services to them. However, they may take the help of his ideas written in this article and in his other relevant articles. Government of India under the leadership of Prime Minister Shri Narendra Modi has started several people’s welfare-oriented schemes, viz. Pradhan Mantri Jan Dhan Yojan (to ensure access to financial services, namely Banking Savings & Deposit Accounts, Remittance, Credit, Insurance, Pension in an affordable manner), HRIDAY – Heritage City Development and Augmentation Yojana(to preserve and rejuvenate the rich cultural heritage of the country), Sukanya Samridhi Yojana (Girl Child Prosperity Scheme to ensure equitable share to a girl child in resources and savings of a family in which she is generally discriminated as against a male child), Deen Dayal Upadhyaya Gram Jyoti Yojana (to provide 24×7 uninterrupted power supply to all homes in Rural India), Atal Pension Yojana (Social Sector Scheme pertaining to Pension Sector), Pradhan Mantri Suraksha Bima Yojana (Accidental Insurance with a premium of Rs. 12 per year), Pradhan Mantri Jeevan Jyoti Bima Yojana (Life insurance of Rs. 2 lakh with a premium of Rs. 330 per year), Smart Cities Mission (to enable better living and drive economic growth stressing on the need for people centric urban planning and development), Atal Mission for Rejuvenation and Urban Transformation (AMRUT – to enable better living and drive economic growth stressing on the need for people centric urban planning and development), Pradhan Mantri Awas Yojana (PMAY – to enable better living and drive economic growth stressing on the need for people centric urban planning and development), Skill India Programme (National Skill Development Mission – to provide the institutional capacity to train a minimum 40 crore skilled people by 2022). However, Indian Prime Minister Shri Narendra Modi’s effort and implementation for good governance with cooperation of dedicated, devoted, good and intelligent team of ministers including of center and states, and with the assistance of honest, hard working and uncorrupt bureaucrats will make them all feel for true people governance through timely delivery of services to the people, and it will be the ideal for other nations also to follow for providing good governance to all people of their respective nations. This will be the first and novel experiment in the world, and if it succeeds, the credit will go to Shri Narndra Modi, Prime Minister of India, and he will be world-wide honored and recognized as a political-intellectual saint, not only for this century, but all the centuries to come. Violence is the outcome of bad governance everywhere whether it happens in family, school or university, religious institution or state of democratic or non-democratic nations. Mostly violence is initiated by those who are in authority or in possessed position, and in its retaliation; more severe and cruel violence was committed by those who are powerless and in dispossessed position for change in authority. World Report on Violence and Health (WHO, 2002) tells us that no country or community is untouched by violence. Images and accounts of violence pervade the media; it is on our streets, in our homes, schools, workplaces and institutions. Violence is a universal scourge that tears at the fabric of community that threatens the life, health and happiness of us all. Each year, 1.6 million people world-wide lose their lives due to violence. For everyone who dies as a result of violence, many more are injured and suffer from a rage of physical, sexual, reproductive and health problems. Violence is among the leading causes of death for people aged 15-44 years worldwide accounting for about 14% of deaths among male and 7% of deaths among female. More than 20 million people lost their lives in World War I, and 40 million more were killed in World War II. Since the United Nations was founded in 1945, there have been over a hundred wars, with 20 million people killed. In the 20th century, there was an estimated 110 million deaths. Timisoara Genocide (1989), Genocide in Bangladesh (1971), The My Lai, Massacre (1968), Youth Massacre in China (1989), Genocide in Sri Lanka, one Million P.O.Ws Starved, The Jalliawala Bagh Masssacre (1919), Genocide in Cambodia (1975-1979), The Burundy Genocide (1972), Genocide of Jews in Germany (1938-1945), 60 million massacred by Stalin (1832-33) are the cruel, horrible and painful events of violence. Violence is inherent in the system of about 139 non-democratic nation-states where a handful of people have the power to declare which persons or groups should die. In 50 to 60 democratic or quasi-democratic countries, the economic and political elite commit violence by manipulating power, money and resources. In retaliation, violence committed against masses ignited several rebellions in England from 15th Century to 16th Century, American Revolution in 1775, French Revolution in 1817, Russian Revolution in 1917, and several other revolutions in other parts of the world. One king after another was murdered for the liberation of people. Emperor of Germany, the King of Italy and the King of Spain were assassinated. In 1979, another King of Spain was assassinated, in 1881, Czar was murdered. In 1883, the Emperor of Germany was assassinated. In 1898, the Empress Elisabeth of Austria was murdered. Louis of France and Charles of England were both axed. Assassinations of the great political leaders of the world, viz. Abraham Lincoln, John Kennedy, Robert Kennedy, Martin Luther King, Benazir Bhutto, Indira Gandhi, Rajiv Gandhi, Yugoslavia King Alexander, De Gaulle, and several others are also the sordid, unpleasant, terrible and sad happenings of violence. Terrorism, which is also the product of bad governance, is another form of cruel and inhuman violence. Today the whole world is being gripped by terrorism. Most of the nation-states are facing “genocide”, “ethnic cleansing” and ‘global terrorism”. According to Global Terrorism Index (Institute for Economics and Peace, 2014), in total there have been over 48,000 terrorist incidents over the last 14 years claiming over 107,000 lives. Terrorism has increased dramatically with even conservative estimates suggesting a fivefold surge since the year 2000. In 2013 alone, almost 10,000 terrorist incidents were recorded, resulting in approximately 18,000 deaths. The significant majority of these incidents, over 60 per cent, occurred in Iraq, Afghanistan, Pakistan, Nigeria and Syria. The increase is due mainly to terrorist activity within these five countries. As a consequence, these countries have experienced a dramatic increase in the loss of life in 2013 with fatalities reaching 14,722 collectively. Excluding these five countries in 2013, there were almost 4,000 attacks in the rest of the world killing 3,236 people. This represents an increase of 54 per cent over the prior year. Other than the five most affected countries, the trend over the last 14 years is upward with terrorist attacks substantially increasing by 180 per cent. Furthermore, terrorists are largely successful in carrying out their tactical objectives. In fact, except education of man – what he or she is – we have all types of education, at least for a few privileged. And these educations make a few doctors, engineers, lawyers, teachers and other professionals minus man (human), and many are deprived of these educations. In this sense, the present education destroys both – those to whom it reaches, and those to whom it is denied. We are people of different nations, faiths (religions), relations, races, but we are not man (human). Man (humanity) is missing from us. Hence, we are exploiting, oppressing, fighting and killing each other, and sometimes we are killing ourselves also. A large number of corrupt and criminal persons (law-breakers) who are the products of mis-education and non-education are the part and parcel in the governance (as law-makers) of people in different parts of the world. One may refer to the book entitled: World Famous Corrupt Politicians (authored by Nemisharan Mital and published by Pustak Mahal, New Delhi in1992) to validate the truth in this regard. India is a great democratic country in the world. However, about 30 percent of India’s M. Ps. (Member of Parliament) – law-makers faces criminal charges. Going by the records of the Election Commission, the Association of Democratic Reforms says that 162 out of 545 MPs (Members of Parliament) and 1258 out of 4,032 sitting MLAs (Member of Legislative Assembly) have declared that there are certain cases pending against them. Besides them, bureaucrats, with a very few exception, though they are intelligent, but not good, are mostly corrupt. They violate the Government Resolutions (GRs), Articles of the Constitution and dishonor the orders of the Courts. Even though they are rarely held responsible and punished for their wrong doings. The report by Hong Kong-based Political and Economic Risk Consultancy ranks bureaucracies across Asia on a scale from one to 10, with 10 being the worst possible score. India scored 9.21. It also said that Indian bureaucrats were rarely held accountable for wrong decisions. Judiciary is also not free from corruption. Justice Markandey Katju, Former Judge of Supreme Court of India has written in his article: Corruption in the Indian judiciary, and told “In 2001 the then Chief Justice of India, Justice Bharucha, said that 20% High Court Judges in India could be corrupt. My own estimate is that today that figure could be as high as 50%.” And in lower courts, corruption is more and rampant. Former Law minister Kapil Sibal admitted in an Interview and said, “There is corruption in the judiciary. This has been admitted by no less than several previous chief justices of the Supreme Court. The worry is that this malaise, some say, is “rampant” in the lower echelons of the judiciary, where the common man seeks justice”. great hurdle in the path of reaching relief and fruits of development to all and even to the needy people of the nation. It is a great challenge and herculean task before the present government which is determined and committed to provide good governance to the people. Though nonviolence is the result of good governance, but we hardly get any trace of good governance either in democratic or non-democratic forms of governments anywhere either in past or present. Certainly, we find in the history a very few kings and emperors who provided good governance to their subjects. In ancient India, there was a king named Rama, and it is said that under his governance, there was no physical, mental and spiritual sufferings to anybody. All loved each other. No one died in early age of his life; all people were free from sorrow and pain, disease, poverty and ignorance. 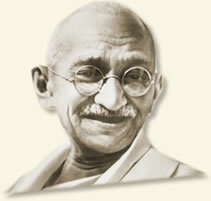 Though Rama was a King, Mahatma Gandhi wanted the governance in the state politics like rule of Rama. There were kings in ancient India who had intellectual and wise persons as ministers and advisers for good governance who were the hidden rulers because their advices were followed by the kings. Rishi Vashishtha (a saint intellectual) was the adviser in the Kingdom of Shri Rama. In the period of Mahabharata, Vidur (an expert in state politic and a fame of Vidur-Niti-ethics) was the chief consultants and minister in the empire of Kaurava. Emperor Bharata, on whose name India is known as “Bhāratavarṣa“, was just and democrat in practice. He discarded his own sons from being his successors as King because they were not fit for the post of emperor. Hence he gave the reign of his empire in the hands of intellectual son of Saint Bharadvaja. Saint Ashtavakra was the intellectual adviser in the regime of King Janaka. Kautilya (Chankya–an intellectual giant in state politics) was the mentor and adviser of King Chandragupta. In modern India, though it has adopted democracy and government is formed by the elected representatives of the people to provide good governance to them. But alas! The elected representatives are far from the people and off the people, and good governance (delivery of better services) is a dream for them. And there is a constitutional provision that 12 members among the intellectuals from the field of science, culture, drama, art, music, literature, social work etc. are nominated by the President for the Upper House (Rajya Sabha) of the Indian Parliament to control them from committing wrongs and to assist them for providing good governance to the people. However, recently the ruling party manipulates in nominating persons from intellectual categories to the Upper House of the Parliament, and it sends the defeated persons in the election to the Upper House from the categories of intellectuals. Bureaucrats, who are intelligent, but not good (with a very few exceptional), the elected representatives of the people solely rely on them, exactly rule the people arbitrarily; they are not in any way helpful in good governance. The politicians tell us ‘You must educate the masses because they are going to be masters’. …And a few voices are lifted up in favour of the doctrine that the masses should be educated because they are men and women with unlimited capacity of being, doing, and suffering, and that it is as true now, as ever it was, that the people perish for lack of knowledge. Unless everybody can be educated, democratic aspirations will shortly seem naive, and man must renounce his claim to be called a political animal. He will be ruled by a bureaucracy, which may guarantee him certain rights, but not the right to achieve full humanity through political participation. The lot of people will be bread and circuses. Truly, we all people are very far from proper education that is man-making education or we may call it peace education. Peace education is the basis for good governance. Only man-making education that is peace education can prepare every man and woman for good governance leading to nonviolence. Therefore the author of these lines has proposed his concept of peace education for establishment of genuine democracy, and practice of good governance leading to nonviolence everywhere. His definition of peace education is knowledge, awareness and integral manifestation of physical, vital, mental, intellectual and spiritual energies already in every man and woman irrespective of any discrimination of caste, creed, race, gender, nation, and of other differences. His peace education is awareness for its theoretical concept thoroughly and deeply, and it is more for practice. It is self-education. It is education of the self, by the self and for the self – for living together through mutual co-operation and help for co-existence, co-prosperity and co-peace, which leads to establishment of genuine democracy and for its perpetuation and for practice of good governance. Good governance, nonviolence and other values are the by-products or secondary products of peace education of the author of these lines. Primary product of his peace education is integral manifestation of five elements in men and women. These are not merely the words as values to be learnt and skilled in them and to prepare others to follow as practiced in prevalent peace education. Current peace education may be one of the types of remedial educations like disarmament education, tolerance education, women education, education for international understanding, education for nonviolence and education for other similar problems, because in future, we may have education for anti-terrorism and other forms of anti-violence. And the exiting peace education may cure the symptom of violence and bad governance, not the cause of violence and bad governance. However current peace education is not for all. Only a very few privileged well-to-do have the access to the present peace education. But in definition of peace education of the author of these lines, the inherent five energies, as stated above, in every man and woman are very prone to be known and realized integrally and perpetually by everyone. This peace education should be core-subject in all educations from nursery, primary, secondary to higher education. And this peace education will go beyond campus education and will continue till the end of life of all men and women. Anticopyright: Editorials and articles originated on TMS may be freely reprinted, disseminated, translated and used as background material, provided an acknowledgement and link to the source, TMS: Politics of Good Governance for Nonviolence: The Role of Peace Education, is included. Thank you.